Here at Warpstone Flux, we are supporting the NOVA Open Charitable Foundation. For the duration of the raffle, there will be a banner on the right hand side sidebar to click on and enter the raffle. The reasons that we are supporting this are multifold, but they are supporting charities that we personally believe in and have had a positive, and personal, opinion of. The charity raffles are now open, and will remain open until 2nd September. 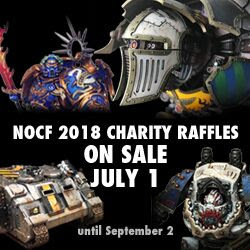 There are plenty of high quality prizes for these raffles, including, but not limited to a Warlord Titan, a 30k Iron Warriors complete army, and a 30k World Eaters complete army ... plus plenty more besides (these are simply the ones that drew my eyes immediately!). Check out the link and have a look at the awesome paint jobs -- they are certainly inspiring! That Warlord by John S, is amazing prize all on its own, but so many other great Army prizes to suit everyone's taste and a good cause. I've bought my tickets.